"As for Yiayia's loomed blankets: You may remember seeing the loom in that back storage building behind the original house. Dad says that in the years she was using it that it pretty much stayed in the lower level of the house where she worked on them. He remembers her doing it for a few years. The blankets were made primarily for dowries for the daughters, but there was a stack of blankets in a bedroom in the "new house" that was as high as the "doulapi" (I think this means cupboard maybe- dad? I dare you to type a comment yourself and answer that question for us), so she also made them for the granddaughters. Artisans came around to the villages and "set" the looms for the design. The wool is primarily from their sheep, but Dad says she may have also needed to purchase some wool. She did spin the wool after cleaning it. Dad thinks that she also did the dyeing and assumes that she purchased dyes." There. Gracious. She had 6 children running around her home (hmmm sounds familiar), but what she managed was quite remarkable. I am going to be including some images of her work in my upcoming book, and will share more here eventually too. The above detail is a snippet of one of the needlepoint projects from the book. My feeble attempts with beautiful wool- wool that is not raised nor fed nor herded nor sheared nor spun nor dyed by me. ps. does that young buck look familiar? That is beyond incredible! I'm so impressed with your family. I just cannot even imagine the amount of love your Yiayia poured into this piece and how much you are treasuring it at this very moment. What a special thing to have. I'm so excited to see more of your projects! I love the colors in your needlepoint! And could that deer be the same one that appeared in Little Folks? That is such a beautiful blanket. I only have memories of my nonnis but from my husbands side we have rugs and quilts made by hard working hands. What a beautiful creative share. Crafts like these tie us to the generations before and after us and serve as threads to our own personal stories. Thanks for sharing some of your Yiayia with us! That is amazing beautiful! 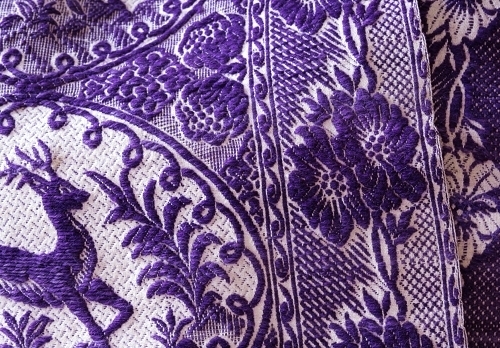 My grandmother did beautiful piecework with very limited resources. Unfortunatly, I do not have any examples of it. Yes - doulapi means cupboard! Is there a better word than "beautiful?" My goodness... not just her work, and diligence, but the beautiful way your own work connects and honors hers. Really, truly lovely, Anna Maria. I look forward to seeing more. Ντουλάπι or doulapi is indeed a cupboard. What a beautiful blanket! My mom took her mom and her two other sisters the other day and went to visit her grand mother, in a remote village In NE Greece. They cleaned up the house and -oh the horror- thew out dosens of old and battered hand-loomed blankets scattered around the house. I almost cried when she told me. You see, as most Greeks are surrounded by buildings and artifacts that are hundreds and thousands of years old, we tend to overlook the value of such 'modern' items. Your grandmother's handiwork looks so gorgeous! What a thrill to have such a creative family with so much history and handmade treasures. I can't imagine how heavy and warm that piece is. I also can't wait to see more of these family treasures in your upcoming book! 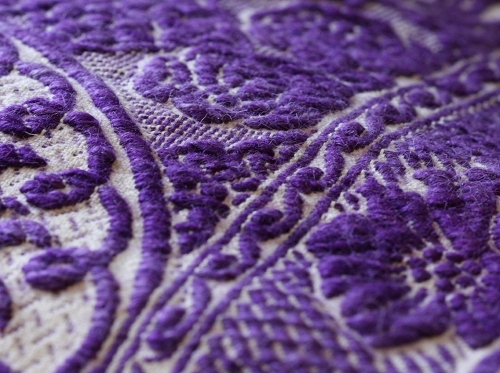 I love peak of that needlework - such fun colors and texture. What an unbelievably beautiful piece! That is a real treasure, there. Such a lovely piece and the story makes it even more lovely. (Guess that would be lovelier...duh) The pleasure of the connections goes so far beyond the work itself, I treasure the one piece I have, my Great Grandmother started it in the 40's, my Grandmother worked on it in 50's and finally my Mom backed and bound it in the 70's. My heart swells each time I see it on the quilt stand. Your new book is going to be amazing! So much to draw from, so much backstory and rich history. And I love that shot of your needlepoint, even if you are a slacker (jk). I'm so happy that you are feeling the way that you are about this new book. You need a friend like that. That blanket is beautiful - the design, the color. I would gladly drape it across my bed, or anywhere in the house for that matter. Can't wait to see the whole thing. I'm amazed at the beautiful work your Yiayia accomplished, but then I'm pretty awestruck at what you have accomplished! Thanks for sharing! A quick bing search yielded "doulapi" as Ancient (not contemporary) Greek and returned results such as "An Indian in the Cupboard" (movie), so my guess would be "cupboard" (as opposed to Indian :-). Love the blanket. AND the color (purple is my favorite). SO rich! I too spin my own yarn, but not from my own sheep or goats, but many still do. Also many still engage in natural dyeing. It's no more time-consuming than y/our other interests. It's just part of what we women (and some men) do, thankfully no longer by necessity. Recognized the young buck right away. wow. that is simply amazing. what a treasure! My mom and I are both stunned by the artistry of that blanket, even though she comes from an Old World Austrian family that used to do the same sort of things. What an incredible piece! so so so so gorgeous! what an heirloom, girl! my grandmother taught young ladies to sew in the 1920's and I have her homemade book of examples including things like frog closures. What a great, great story! Thanks for sharing that with us. And yes, I do recognize the young buck, of course. I am smiling, can you see? How amazing that you have these! It's wonderful. Muy bello trabajo , pero sobre todo hermosa herencia de tu Yiayia en trabajo y en amor. Your grandmother's blanket takes my breath away! I can not wait until your new book comes out. Thankyou again for such an inspiring blog.My grandmother came from Russia when she was 17 and supported herself by being a seamstress.Then she met my grandfather,who was an iceman(sold blocks of ice) in Teaxa. And that was beginning of her life in America. What do you mean "what she managed was quite remarkable", hello? pot calling the kettle black? I marvel at what you do and achieve with your busy family life - I remember being pregnant and seeing gorgeous photos on your blog of Roman hanging out with you while you sewed and I thought.....ahhhh....that'll be me - HA! How wrong I was! I tell you though, I have fallen in love with embroidery because it is so contained, easy to pick up and put down, perfect for the Mother of a very busy toddler - needless to say I am looking forward to your new book coming out. Thank-you, Anna, for sharing these very personal stories with us. Yes, I do recognize that young buck! And, gosh I can't wait to see your new book!!!! I am named for my American Grandmother, Anna, though we pronounce it in Greek (Awna). I am not the oldest daughter, so I am not named for my Yiayia, but my sister Eleni is :) And my brother is named for my Papou, George. Also my Yiayia never immigrated, only my father did when he was 17, and he is one of 6 but we are the only family here. 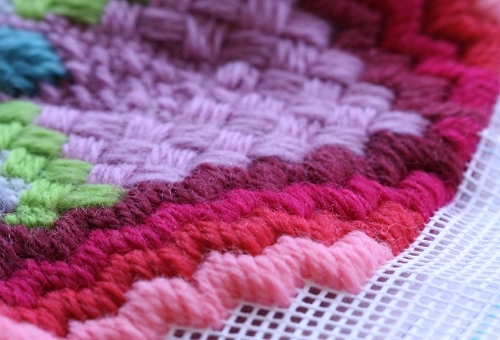 this type of blanket is made of white cotton and sheep wool (in some bright color usually). In Central Greece (Roumeli) we call them "mantania". Yes, doulapi means cupboard. And that blanket is beautiful. The colour is gorgeous. Thank you for sharing. AMAZING!!! it's no wonder you are so talented... with so many creative powers coming from both sides of your family :) i love your new wool piece... getting more and more excited about your book every time you write about it! so... did the inspiration for "young buck" come from your grandmother's blanket or is that just a total coincidence?? thanks for your ever amazing inspiration! Fabulousness! I am so happy to have stumbled into your work via the lovely little beth mathews. Your work and story is very inspirational as I am a momma starting a little buisness in our basement. Your colors and patterns, the texture and work into your grandmother's quilts...beautiful. Look forward to exploring your site more! Thanks! I love to do needle work. Seeing this I am so WOWed. It is such a beautiful piece, and to know it is an heirloom from your grandmother makes it more special than I can say. This is a true treasure. Just lovely! Gorgeous thing! It seems like ones life work is in it! What incredible beauty. And what a blessing that you have them to cherish. I have my mother-in-laws wedding trousseau. None of her daughters thought it was worth keeping (UNBELIEVABLE! ), so I was lucky enough to inherit it. It's filled with hand made lace cutwork from nuns in Sicily, beuatiful sheets and pillowcases, antimacarssars, doilies, table cloths and bedspreads. I love going through it.